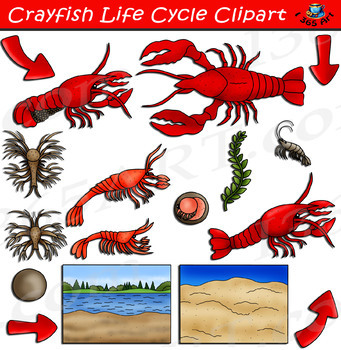 Learn more about the life cycle of crayfish with these brightly colored graphics! Teach your students in an exciting and entertaining way using these clipart graphics! This set contains 36 clipart files in both color and black and white. This download contains some of the following graphics. 2 Adult Crayfish, Algae, 2 habitat backgrounds, crayfish with eggs, 1 egg, embryo in egg, mysis stage, nauplius stage, post lavral stage, protozoa, post lavral stage, shrimp and 4 arrows. Files will be downloaded in a zip folder file. The zip file contains the following - 18 PNG clipart graphics in Color (300 DPI) - 18 PNG clipart graphics in Black & White (300 DPI) - Printable, great as computer graphics, printed images, teaching material, school projects and more. All clip art from the shop is hand drawn and digitally colored by myself - I 365 Art.You may use this file for commercial and non-commercial purposes. However, you are not allowed to resell any of the graphics as is, you must use it for an actual product such as merchandise, projects etc. All graphics are copyrighted to and the property of I 365 Art. 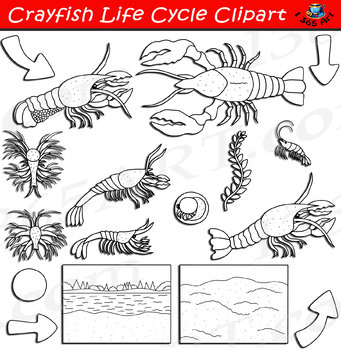 You may also like these additional Life Cycle Sets.